In this tutorial, we will look in details at IBM Rational Quality Manager (RQM) integration with Rational Functional Tester (RFT). IBM Rational Quality Manager is the Test Management solution that is a part of the IBM Rational CLM. It offers the capability to create Test Plans, Test Cases, and Test Scripts. 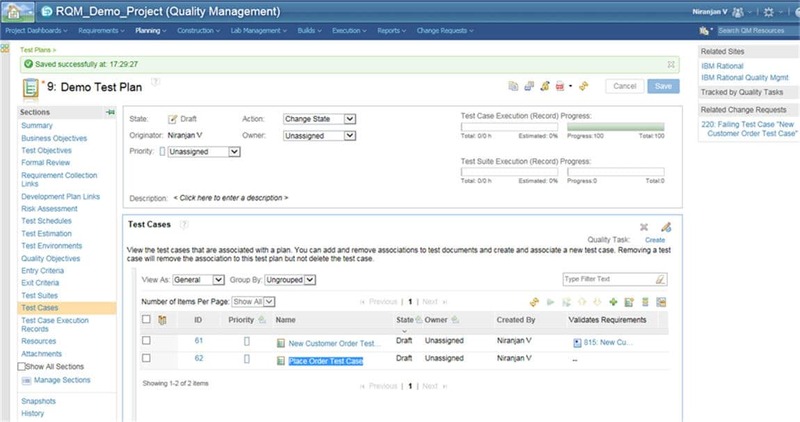 It offers manual execution of the test cases by default out of the box with defect tracking well integrated as a part of IBM Rational Collaborative Life Cycle Management platform (CLM). It also enables you to integrate and run automated tests created with other testing tools like IBM Rational Functional Tester, Selenium, HP QTP etc. IBM Rational Functional Tester is the automated functional and regression testing tool which provides automated and data-driven testing capabilities for GUI and Web-based applications. It supports applications based on Java, Dot NET, SAP, and Siebel. On the windows platform, RFT provides complete recording, playback, and execution capabilities. The resulting script is in JAVA for JAVA users/testers OR Visual Basic Dot Net if the testers use Visual Studio Dot NET. RFT comes built in with Eclipse where the testers can record, playback and execute scripts created in JAVA. This article will focus on using IBM RQM and integration with IBM RFT for Java based applications. Please refer to this URL for complete instructions on installing RFT v8.6. Once RFT is installed you will get to see the RQM Integration Adapter installed along with it. The RQM adapter needs to be configured in order to be used with RFT. To start the configuration click on Configure Adapter and enter the information based on your RQM installation. Click on Start Adapter and you should see the message in the Adapter Console TAB as Connected. Minimize the screen and do not close it during the entire integration process. The screen below shows a sample RFT script created using the recording feature. The above script will be used for integration with RQM Test Case. Remember to Save the changes after creating the Test Case. By default, Manual Test Scripts can be linked directly to the Test Cases created in RQM. To link the RFT script to the Test Case created above you will need to import the script created by recording in RFT into RQM. The started RQM adapter is displayed. In Step 2 enter the RFT Eclipse Workspace path followed by the RFT project. This is usually the path which is entered while launching RFT for recording any scripts. Click on Go button. You will now be able to select the automated script that is created by the recording capability of RFT. Select the script and click on the Import button to complete the importing of the script in to RQM. Browse to open the Test Case created previously. In RQM select Constructionà Browse Test Case. Click on the Place Order test case and go to the Test Script section. Select the check box next to the script created by Rational Functional Tester and click on Add and Close. Remember to Save. Select the Test Script just imported and click on Run. The test script will run as playback and the test result will be imported into RQM. The result is now displayed. Click on Show result to look at the log files generated from execution. The resulting log files are also imported into RQM as shown. About the author: This hands-on tutorial is written by Niranjan. He is having 20+ years of experience in IT mainly with the focus on ALM improvements. In my next article, I will show how RQM is integrated with another popular automated testing tool called Selenium. detailed tutorial. can you share larger images? You can click on the images and view it as large. Hello Niranjan , currently we are using RQM tool, i need the process to Create Test suites and add existing Test cases automatically to the test suites. Please provide the information to achieve the same.